If you already have functional privacy window treatments such as blinds or shades, but need to add in a little color or texture, this super simple budget-friendly DIY is the perfect fix. This solution requires no holes in the wall and no expensive window hardware. It's perfect for rental situations or can even be used to stage your home to sell. Ah... mini blinds. The bane of every home and apartment on the planet -- and an eyesore, for sure. But installing custom window treatments can get out-of-control expensive very quickly. So what's a mini-blind-loathing homeowner (or renter!) to do? Work with what you've got -- and make it better! 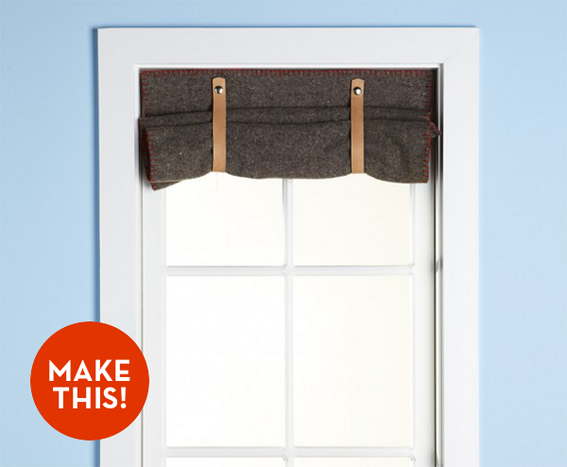 Make It: A Simple Wool Blanket Window Shade! It's time to cozy up for fall! Turn wool blankets into repurposed window shades in a few easy steps--then sit back and bask in the warmth of your handiwork!